This is possibly one of the most beautiful prices of craft I have ever seen. I know I can be a little bias when it comes to bike related beauty but still. 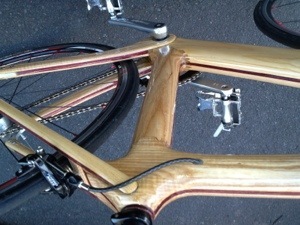 Tim built this bike out of 2 sections of 4mm hollowed out ash and glued them together. He placed metal shims in the head tube, bottom bracket and seat tube. The drop outs are aluminium hand cut with a hack saw. The forks are steel. It rides the bumps like a full suss mountain bike and with its small rear triangle, climbs like a gazelle. 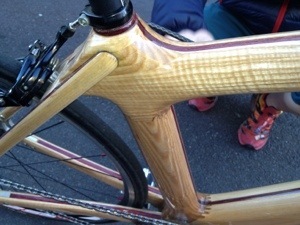 Tim needs partners in the bike industry to be able to finish off his works of art with the best components available. Want to get involved? Wow that’s an impressive piece of workmanship. Best of luck to Tim with getting the support he needs.